18+ New players only. Wagering occurs from real balance first. 50x wagering the bonus or any winnings generated from free spins, contribution may vary per game. Available on selected games only. The wagering requirement is calculated on bonus bets only. Bonus is valid for 30 Days/ free spins valid for 7 days from issue. Max conversion: 5 times the bonus amount or from free spins: $/£/€ 20.Full Terms Apply. BeGambleAware. 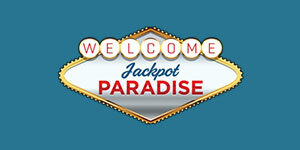 Jackpot Paradise Casino offers different types of casino games such as Slots and they have more then 800+ titles on their site.